I had already come in to comfort my daughter, Elly, several times that night, but feeling suddenly inspired I decided to seize the “gospel” moment. I quietly congratulated myself on my applied spiritual insight in parenting as I watched my three-year-old process this. I floundered for a moment then realized she was remembering the picture of Jesus in the boat with His disciples from her storybook Bible. Rarely do spiritual conversations with your children go the way you envision, especially when they are little! A child’s short attention span and limited comprehension can make these parent-child interactions slightly comical, but I’m convinced the effort is worth it. Sooner or later, ideas will start to stick. The conversations we have today will form a framework for understanding later on. 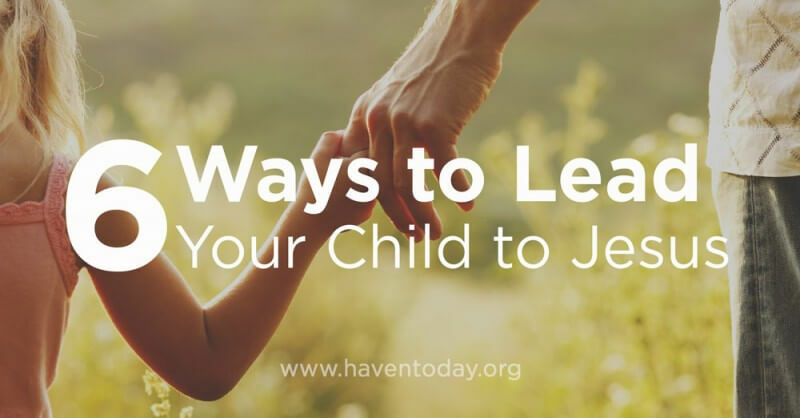 Any Christian parent who wants to learn to talk naturally with their children about Jesus can start by identifying teachable moments in their daily routine. The following list is hardly exhaustive, but it’s a great place to start. Kids love to sing. Shows like Sesame Street and Mr. Roger’s Neighborhood revolutionized children’s programming with this insight. So why not be intentional about the music you play and the songs you sing at home and in the car? I grew up in the 80s listening to Psalty the Singing Song Book. (And I was delighted to discover these CDs are still available online.) But today there are many more options to choose from. The new favorite in our family is the Slugs and Bugs collection from Randall Goodgame, in particular the CDs of “Sing the Bible.” It’s just the right balance of silly fun with spiritual depth. We love that our kids are learning actual Bible verses, as well as the books of the Old and New Testaments. Educators keep telling us there is nothing better to prepare kids for future academic success than reading to them when they’re little. Why not take advantage of story time by reading books that will teach your kids about Jesus? 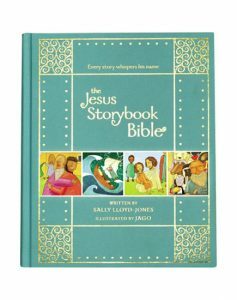 Our girls LOVE The Jesus Storybook Bible by Sally Lloyd-Jones. I don’t know if it’s a common experience for other parents, but after we finish reading a story to them, our girls like to flip back to the beginning and retell it in their own words. And when we turn out the light, the Bible story we just read is a great place to start our prayer time. Many Christian families pray before meals and at bedtime. Prayer time is an easy opportunity to teach your children to pray and, in the process, teach them priceless truths about God. When they’re afraid of the dark, you can remind them that Jesus is the light of the world and a light for us when we’re in the dark. When they’re afraid of monsters (or giants in my daughter’s case), you can remind them that Jesus is bigger and stronger than anything scary. In fact, everything evil is afraid of Jesus, because they know He’s in charge. When they just want Daddy or Mommy you have a chance to talk to them about God the Father, who loves them even more than Daddy and Mommy do. And any scenario like this gives you the chance to pray with them and over them! Discipline is one of the most stressful aspects of parenting. And our parental reactions when a child does something wrong reveals a lot about our own assumptions. When I hear myself say, “Why would you do something like that?” or, “I just don’t understand where this behavior is coming from!” it’s an indicator that I’m forgetting the core of the gospel. Rather than being surprised by our kids’ sin, we should expect it and have a game plan for addressing it with gospel truth. When your child sins it can be a God-ordained moment to talk with them about how much they need Jesus. That only by His death and resurrection can they have God’s forgiveness, the ability to run from sin, and to desire to do what pleases Him. Growth in godly parenting requires intentionality and self-scrutiny. Here are several outstanding books that have made a difference for my wife and me. Much of our parental energy in discipline goes into addressing the sinful behavior of the offending child, but we also have an opportunity with the child who was wronged. This can be your chance to help them understand what it truly means to forgive – that it’s not easy, that the person who wronged them needs their forgiveness, and, most importantly, that we forgive because, through Jesus, God has forgiven us too. It’s worth the time for you and your spouse to talk through each of these six daily opportunities to point your child to Jesus. Decide what you want to convey ahead of time. Of course, it will never go exactly according to script, but over time it will pay off as your child learns the vocabulary of grace and spiritual conversations become a natural part of family life. David Wollen is the Director of Marketing, Development, and Operations at Q Place, and also hosts ANCHOR Today, a one-minute radio devotional syndicated on over 200 radio stations in the United States and Canada. David has a passion for discipleship within the church and for sharing the grace of Christ with all nations. David, his wife, Marci, and their two daughters live in the greater Chicago area. Love it! It is very true.